To me, this is a perfect candid photograph that captures the elusive, carefree element of summer. Beyond the lovely printed bias cut dress (I'm always looking for those on ebay...), look at how the heel of her right shoe meets her shadow. 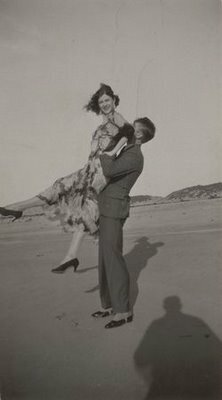 I love that this couple -snapped in 1930 by the invisible friend whose shadow you can see in the foreground- is playing around on the beach in California, but they are still dressed to the nines. Check out his spats! Posted by la femme at 1:16 a.m. I love this photo and I love that dress - photos like this are exactly why i love vintage - they have a history that carries forward - the vintage dress you buy was once worn by some hopeful, bright young woman full of dreams. I have a dress almost exactly like that! It was my graduation dress (U of Georgia) almost ten years ago, and I still pull it out from time to time. Timeless. The trouble with it, however, is that the bias cut has allowed the dress to stretch. It almost touches the floor now, and was originally tea length. I don't know anything about sewing or alterations: can this be fixed? Lux Lotus always has the best pics...I swooned over that one too! very beautiful. where is it in the moma? You are right, that is a gorgeous snapshot! I just happend upon your blog and really like the looks of it. I understand your frustrations with your mom and fashion. *wink* At least we can't say we didn't try! WAAUU ! Phantastic blog, I link you ! Can you link me, please ? Your blog is impressionant ! WAAUUU ! Impressionant blog ! Is so informativa and cool! I adore yoy ! JeJe ! I link you! P.D. Could you link me ? Kisses !